KENNEDY SPACE CENTER, FL--Boeing will use United Launch Alliance Atlas 5 rockets for initial test flights of the company's proposed CST-100 manned spacecraft, a seven-seat capsule being developed for commercial missions to and from government and private-sector space stations in low-Earth orbit, company officials announced Thursday. John Elbon, vice president and program manager of Boeing commercial crew transportation systems, said four test flights of the CST-100 spacecraft are envisioned, assuming continued NASA funding, including an on-the-launch-pad abort test in 2014 that will not require a booster. An unmanned CST-100 orbital test flight in the first quarter of 2015. 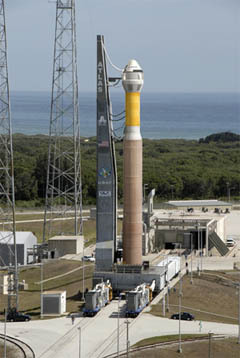 An unmanned in-flight test of the CST-100 abort system in the middle of the year. A manned test flight with two Boeing pilots on board in the fourth quarter. "If NASA selects Boeing for a development contract with sufficient funding, ULA will provide launch services for an autonomous orbital flight, a transonic autonomous abort test launch, and a crewed launch, all in 2015," Boeing said in a statement. The agreement announced Thursday includes development of launch pad crew access and emergency egress systems and an avionics system to detect faults in the Atlas 5 in time to trigger the capsule's abort system. If funded, the rockets will be launched from complex 41 at the Cape Canaveral Air Force Station. The Atlas family rockets boasts 97 successful launchings in a row while the Atlas 5 family has logged 26 successes and no failures. It is certified to carry high-priority national security spy satellites as well as nuclear-powered science missions like NASA's upcoming Mars Science Laboratory. Because United Launch Alliance is a partnership between Boeing, builder of the Delta family of rockets, and Lockheed Martin, builder of the Atlas 5, Boeing's procurement team went through additional steps to show the Atlas 5 selection "wasn't biased by the fact that Boeing is a partial owner of ULA," Elbon said. "I'm really pleased with this selection," he told reporters in a teleconference Thursday. "Our approach is to build a reliable spacecraft built on existing simple systems and then integrate that with a proven launch vehicle, all focused on putting in place a very safe system, one that will be reliable and one that can be operational as soon as practical so we can start flying U.S. crew from U.S. launch sites." While the CST-100 capsule could be adapted to fly atop launch vehicles from other providers, work to "man-rate" any proposed launcher would be required. That work will already have been done for the Atlas 5 and presumably the ULA rocket would be used for initial operational flights to and from the International Space Station and a proposed commercial outpost being designed by Bigelow Aerospace. "Our philosophy going through this whole process has been that we would human rate the system, not the launch vehicle," Elbon said. "So we're starting here with a very reliable launch vehicle, it's been certified to launch extremely elaborate, important NRO (National Reconnaissance Office) missions, also nuclear missions. Those are nearly as critical, and that cargo is nearly as precious, as humans. So we start out with a rocket that's reliable and dependable from the get go. "And then we add on that a very robust abort system so that in the unlikely event there is a problem, the spacecraft can escape and take the crew to safety. Part of that integrated system then needs to be an emergency detection system within the rocket that can monitor its systems and let the spacecraft know if it's seeing some condition that might lead to a problem." Based on Boeing's analysis to date, Elbon said, "there's not a lot of change that needs to be made to the launch vehicle so this system can be human rated." Boeing is in the process of interviewing astronaut candidates and while previous spaceflight experience is a clear benefit, it is not required. Elbon said current plans call for Boeing test pilots to fly the first manned test flight and any non-NASA missions. For operational flights to and from the International Space Station, NASA astronauts presumably will be at the controls. But that assumes NASA continues funding the commercial space initiative at sufficient levels and that Boeing's design wins agency support going forward. In the wake of the 2003 Columbia disaster, the Bush administration ordered NASA to complete the International Space Station and retire the shuttle by the end of fiscal 2010 and to develop new government spacecraft for a return to the moon in the 2020s. Technical issues delayed the final shuttle flight to this summer, but the program is now in the process of shutting down. The Obama administration, meanwhile, decided NASA's Constellation moon program was not affordable and ordered the agency to adopt a two-phase approach to post-shuttle manned spaceflight. In the near term, NASA was told to encourage development of private sector spacecraft to ferry astronauts to and from the space station. At the same time, the agency was ordered to begin development of a new heavy-lift booster that could propel the Constellation program's Orion capsule on deep space missions. It is not yet clear when the new booster will be ready or what sort of deep space missions it will support. 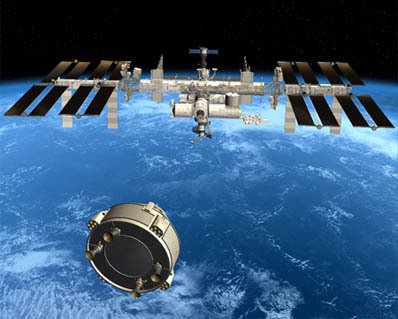 But NASA is pressing ahead in the near term with contracts to encourage development of private-sector spacecraft to service the space station. Last September, NASA awarded $92.3 million to Boeing under the agency's Commercial Crew Development program, known as CCDev2 for short, the second contract in the CCDev program. Other competitors include SpaceX, which won a $75 million contract to continue development of its Dragon capsule, which would launch atop a SpaceX Falcon 9 rocket; and Sierra Nevada, which won an $80 million contract to continue work on a winged mini-shuttle originally envisioned as a space station lifeboat. Blue Origins won a $22 million contract to continue spacecraft design development, propulsion system testing and abort systems. Boeing's Crew Space Transportation 100 capsule, or CST-100, was unveiled at the Farnborough Air Show in July 2010. The spacecraft will be capable of staying at the International Space Station for up to six months before returning to parachute-and-airbag-cushioned landing in the western United States. The capsules are being designed to fly up to 10 times each with new heat shields and service modules added between flights. But NASA must provide funding to continue the spacecraft's development. And Elbon said current levels of funding likely will not be sufficient to get the spacecraft off the ground anytime soon. "I'm hopeful the debate that goes on in DC leads to ultimately increased funding beyond what's been proposed at the moment," Elbon said. "It would, I believe, take that to keep the program on schedule. It's obviously (dependent) on how NASA structures the procurement going forward, how many providers that they decide to carry, things like that. "In my view, this is the quickest way to close the gap and get U.S. crews flying again," he said, referring to the gap between the end of shuttle operations and the debut of a new commercial spacecraft. "It's an affordable approach that will then leave NASA funding to develop capabilities for exploration beyond low-Earth orbit. And so I'm hopeful the budget, once it's settles out here, will support the scheduled program that we've laid out."